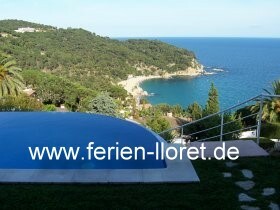 Exklusives Ferienhaus mit privat Pool am Meer. 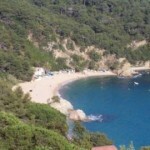 privates Schwimmbad und fantastischem Panoramablick auf das Meer. 5 Doppelschlafzimmer, 3 Bäder und eine schöne überdachte Terrassen. Sonnenterrasse, einem privaten Schwimmbad mit Außendusche und Parkplatz. Die Villa ist voll klimatisiert. Holidays with the family or friends in Moraira on the Costa Blanca! 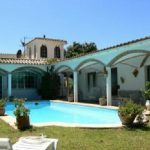 In Moraira you find Top – offers of holiday exclusive villas, holiday homes and apartments on Spain’s Mediterranean coast and for a holiday with the family or friends is Moraira a destination to relax from the stress of everyday life. 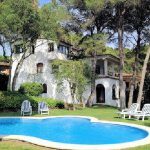 To spend the holiday in Moraira, we offer exclusive villas with private pool, cottages & apartments with best-price guarantee on the Costa Blanca. Visit our website and Read all about it. Moraira in one of the smaller beach resorts on the Costa Blanca. 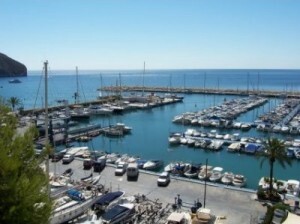 Located in the middle between Valencia and Alicante it has easy access to both those cities international airports. 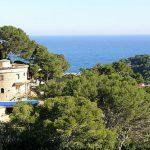 Moraira itself lives a quiet life as one of the smallest beach resorts on the Costa Blanca built around a the original village and a relatively limited but very well maintained and attractive sandy beach. 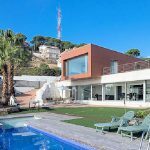 The inhabitants of Moraira are to a large extend english, german and dutch expats opting for the relaxed lifestyle in Spain and making no compromises by opting for a quiet resort like Moraira for the purpose. 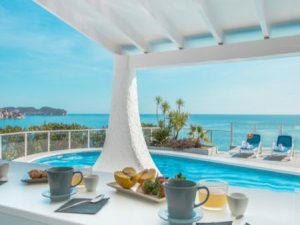 You wont be lacking charming options for a sea view meal in Moraira though with its generous supply of outdoor cafés, promenade restaurants and english pubs such as the Madhatter for wilder entertainment purposes. 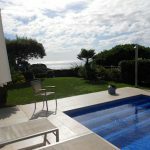 The activities in Moraira are obviously more limited than in busier nearby resorts such as Benidorm, Calpe and Altea, however in many ways enjoying the peace, recharching the batteries and having an undisturbed time is equally that much easier within the realms of the cosy beach town of Moraira. There are live music events to be found in Moraira, particularly an annual festival with mainly english coverbands and regular performances at the irish pub. A few nightclubs will provide you with the pina coladas you need and several tapas places caters for the rumbling tummy. Moraira a weekly outdoor market, occational charity events and local fiestas but truth be told, dont go there for the party atmosphere and wild nightlife, go there if you want to enjoy a more tranquil holiday in the sun to meditate on your own or with your family in a safe and manageable environment. 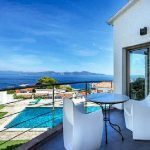 Those inclined to hunt for parties, mad fiestas and nightlife would be much better catered for by choosing a holiday in Javea or in Denia, as those bigger resorts are significantly more geared towards those types of activities. Having a nice peaceful time in Moraira is pure bliss though. Escape from the rain into the sun! 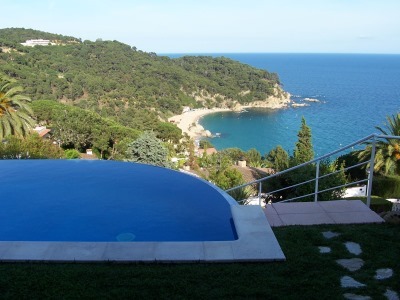 Now book quick your holiday 2013 in Spain on the Costa Blanca in Moraira! 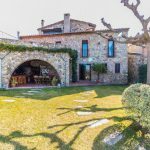 Visit our websites and find the best apartments, villas and bungalows in Spain on the Costa Blanca located in prime location and with excellent facilities. 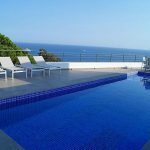 The houses and apartments are suitable for 2 up to 20 people. Visit our website and find out about our services. We look forward to your visit. Ferienwohnungen und Ferienhäuser am Mittelmeer jetzt buchen!